I’ve been moving across towns, from Chapel Hill to Durham this past month. Moving offers on-going opportunities to make deliberate, conscious choice, if we chose to make it so. With every day of the move, with every challenge, (securing utilities, buying and selling on craigslist and obtaining mailbox keys,) I’ve had opportunities to be a deliberate creator of my experience, to be in the awareness of the divinity that I Am, to chose to show up as my Authentic Self. “Moment by moment, choice by choice.” That’s how we live this life of empowerment and effectiveness. “Moment by moment, choice by choice.” That’s the subtitle of How to Pray Without Talking to God, Unity Rev. Linda Martella-Whitset t’s recent book on Affirmative Prayer as taught by Unity and Science of Mind. Unlike what I used to think, prayer has nothing to do with being religious or superstitious. Prayer is about tuning your mind to the Oneness, and claiming your essential thriving essence. That’s what I chose to do, claim Oneness: whenever I can get centered enough to remember to chose it! Linda Martella-Whitsett teaches how to pray from a unity consciousness, step by step, shift by shift. God is not a superhuman, God is Principle. Work with It, and shift your life into satisfaction and empowerment. In our upcoming course “Unity Prayer,” SEE PR250, we’ll explore “what is prayer?” if we understand “GOD” to be Principle and Presence rather than a person. We’ll be creative ith names of “GOD” so we can release our childhood images of the Santa-God, and explore what it means to be spiritual beings having a human experience. We’ll consider very deliberately what words to use that reflect a sense of unity with/as The I Am. We’ll practice saying our own prayers together, aloud, in small groups, with partners. We’ll explore what it means to pray for and with others. Beginning March 31, Join us for this 5 week series of classes from your own comfortable desk or living room. 7-9pm Eastern Daylight time. Thursdays March 31-April 21. 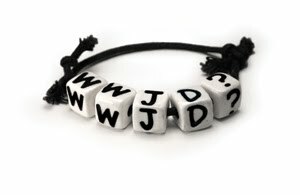 Remember those “WWJD” bracelets? They were intended to help us ask ourselves “What Would Jesus Do in this situation?” As we all know, a teacher’s actions speak much louder than his or her words. Memories about Jesus recorded decades after his ministry reveal that Jesus instilled an effective, positive, practical teaching about prayer. Today, on Unity’s World Day of Prayer, the theme is “Pray Up!” As I visualize people across the nation gathering in their spiritual centers to pray together, I think of our Way-Shower Jesus “praying up!” How did Jesus pray? Based on what the ancient writings, Jesus probably prayed quietly. But quiet can be powerful! “Whenever you pray, go into your room and shut the door and pray to your Father who is in secret; and your Fathe r who sees in secret will reward you.” (Matthew 6:6) I see Jesus sitting quietly, kind of like the Buddha statue on my shelf, meditating upon the perfection of the All That Is and knowing his Oneness with It, in It, as It. He addressed the God-of-his-understanding as “Father,” implying that he had a very personal understanding of The Divine. He talked about the Father who is in secret. Not because The Divine is a secret, but because It is within, in the secret place of his consciousness; the constant, internal Source of all “in whom we live and move and have out being.” (check this out: the writer of Acts 17:28 has the apostle Paul quoting from a semi-mythical 7th century BCE Greek wisdom teacher Epimenides[i]). The act of tuning out egoic thought and tapping in to Source is a powerful tool of Jesus’ compelling ministry. Today, I visualize my Unity friends all over the world wherever they are, sitting in silent meditative prayer, knowing Source within and all around them, as Jesus did. Jesus taught us to forgive when we entered into that sacred chamber within. “Whenever you stand praying, forgive, if you have anything against anyone; so that your Father in heaven may also forgive you your trespasses.” (Mark 11:25) Letting go of that yucky, irritated, hurt, P-O’ed, or devastated feeling against someone is a huge, essential step in our prayer practice. What does it mean that the writer of Mark wrote, “so that your Father may also forgive you?” The “Father” is the Christ Consciousness, the True Self, the I Am of you. How can we come into a consciousness of Oneness with All That Is if we have angs t about someone else? Thomas Merton said “The beginning of love is the will to let those we love be perfectly themselves, the resolution not to twist them to fit our own image.” The willingness to let people be who they are is forgiveness. Today, I see myself and my friends forgiving all who seem to be against us. For no one and nothing is against me. I am One with All That Is. Jesus gave thanks in advance. “… he took the seven loaves, and after giving thanks he broke them and gave them to his disciples to distribute.” (Matthew 15:36) As Way-Shower, Jesus teaches us to expect the blessing when we ask. He gave thanks befo re it even happened because he had no doubt that it would come forth, is coming forth. “Ask and it will be given you.” (Matthew 7:7) Simple, No doubt, No worries about if it will come or when it will come. Jesus knew it was so. We like to end our prayers with “And so it is.” It’s a way to release the request. We don’t beg for it. We claim it. We expect it or something even more appropriate. It is so. That’s what Jesus knew, too, so he gave thanks before his desire was spoken. He knew that when he asked he would receive. Unity uses an affirmative prayer process based on Jesus teaching: Relax and go within, know the Oneness, give thanks, claim and realize your good, then release any doubt and know it is so. It is a powerful, practical tool for positive living. We use that form of prayer at Unity’s 24/7 prayer line Silent Unity and in our Sunday services and classes. Today, I join my friends in all places and give thanks, knowing that what we need, desire, ask and imagine is so. And so we let it be. This year, Silent Unity’s World Day of Prayer’s theme is “Pray Up.” I get what it means to “pray up!” My ministry as a Prayer Associate at Silent Unity taught me the depth of that phrase. My experience there, while in Seminary at Unity Institute, was unforgettable and indescribable. (If you have any theological questions about prayer, believe me, they will come up while at that job and give you a chance to work through them!) Every prayer I spoke affected me, too, of course. Does the Oneness know separation? I would climb the stairs to the prayer room sometimes tired, sometimes distracted, sometimes agitated that I had to stop working on a term paper to go to work. Then I would open the doors to the prayer room and immediately feel the amazing grace th at was in that place. In that space made sacred by prayer action, associates are in prayer 365/24/7! Entering the room would immediately lift my spirits. I would find my place and, after centering, would begin answering calls. “Silent Unity. How may we pray with you?” Minute by minute, hour after hour, every prayer I spoke lifted my consciousness higher and higher. So that when I finished my shift I was elevated, renewed, inspired, reinvigorated to go back to my room and continue my studies. So, yeah, I know what it means to “Pray Up.” It means get your batteries charged up, to raise your vibrational level, become energized by the “highest form of mind-action” one can do. (That’s a Charles Fillmore quote) It was indubitably the most effective activity I could do before I entered the Licensing & Ordination interviews! You and I don’t need to work at Silent Unity to benefit from that energy. We can enjoy it anytime with a 5-minute phone call to 1-800-NOW-PRAY (669-7729) Or you can learn to create a Unity affirmative prayer for yourself, and practice, practice, practice. The more you pray affirmatively, the more vivid your understanding of the Oneness, and the more energized your body, mind and spirit will be. Join our Unity Prayer course in the virtual classroom beginning October 1. Why read the Bible? … Good Question! Overview of Christian Scriptures begins tomorrow, Thursday Aug 27. As I’ve been preparing for the course, an unexpected bonus gift has been a new way of seeing the Sacredness of Sacred Scriptures. One of the topics we’ll discuss is “Why read the Bible? This is question that many people have been asking lately – say in the past couple hundred years, and increasingly more in the past 50 years. Today’s modern/post-modern population is rapidly exiting the church, and closing their Bibles for the last time. I closed mine for many years because as I grew intellectually and became aware of a global spirituality, I became less and less able to read the Bible as I had been taught to read it. I could no longer see it as “God’s Word” which would have any significant message for me. The text for this course is by beloved, brilliant Marcus Borg: “Reading the Bible Again For the First Time: Taking the Bible Seriously, But Not Literally.” The most significant word in that title is Again. He explains a new way to see the Bible, using the lens of the Post-Modern world-view. Borg suggests that we see it as “Sacred Scripture,” meaning several things: the first is that it has molded our cultural-linguistic world. He says a “sacred writing” is the “Word” even if read metaphorically. It’s all about the Divine-Human relationship. He points out that it is used as a sacramental vehicle: many people over many years have used it for guidance, or for devotional, meditative inspiration. (“I lift my eyes into the hills, from whence comes my help.” (not literally, but spiritually: when we’re in the muck and mess of life/ego, our help/clarity comes through the action of “lifting our eyes” into a higher level of thinking/being). And, if only from a cultural-anthropology standpoint, we could value knowing the Bible because it is a base from which we engage in dialogue. Many people didn’t grow up learning about the Bible. They don’t know the stories and their characters. Others know them only from their moralistic Sunday-School lessons. Others know the stories only from brief exposure to them, but really don’t know the message they bring. If we know the Bible’s stories and metaphors, we can engage in conversation. If we don’t know them, we’ve lost out on a big element of Western culture. Register now and join the six already registered in our virtual classroom for the next 4 Thursdays, 7 -9:30 pm, (eastern time) Beginning tomorrow night! Join us for 3 Sunday afternoons at a virtual mini-retreat in September! 4-7:20 pm (eastern time). Take a close look at the hours of this session. Your first impression might be overwhelm: how can we sit around for three hours and just talk, or just listen? As a former professional teacher of pre-adolescents, I know the power of changing things up: Presenting ideas in a variety of ways; Engaging your active participation; Including everyone who wants to participate; Using pictures, video and cartoons; Guiding you to answer your own questions; Holding all contributions in confidentiality; Honoring your right to change your mind…. and I know how to facilitate and build in active learning so we can honor different learning styles. But seriously, the topics are so engaging that we’ll have to watch our discussion times so we can cover everything that is offered! I have always enjoyed the great discussions this course brings! The topics in this course are what your Unity minister might incorporate into a Sunday talk, and this will be your opportunity to dish them onto your plate, cut them into pieces, munch on them, digest them and truly make them your own. And speaking of food, yes, you are allowed to eat during class! I build in generous breaks for you to stretch, prepare a snack, and even take a short walk outside. And all from the comfort of your own home through our virtual classroom! Thanks to the 21st century Unity textbook “Heart Centered Metaphysics,” this mini-retreat will present a new way to hear 19th and 20th century New Thought teachings. In our first session, we will explore through readings and conversations the idea of “God” and “human n” as Oneness. We will play with Plato’s idea (foundational to New Thought) regarding the Absolute and the Relative, the “spiritual universe” and the “physical universe’. And we’ll face the paradoxes that come with trying to define The Divine. The second session helps us define traditional Christian terms in a New Thought viewpoint: the trinity, sin, evil and the devil and Jesus Christ. Our final session explores, through head and heart, discussion and meditation, the nature of humankind; what it means to be a spiritual being in a physical world; and how to differentiate your Inner Voice from your egoic voice.